'Orchids Through Darwin's Eyes' This Orchids. These brilliant, flashy, sensual, and sometimes graphic flowers fascinated Charles Darwin. This year the Smithsonian National Museum of Natural History has made Darwin's interest in the flowers the theme of their annual orchid exhibition. "In my examination of Orchids, hardly any fact has so much struck me as the endless diversity of structure ... for gaining the very same end, namely, the fertilisation of one flower by the pollen of another." To Darwin, orchids were vivid examples of natural selection and of mechanisms that develop over generations to best ensure the perpetuation of the species. 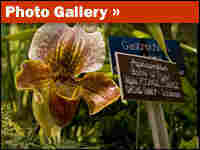 This year the Smithsonian National Museum of Natural History has made Darwin's interest in the flowers the theme of their annual orchid exhibition. Host Liane Hansen takes a tour of "Orchids through Darwin's Eyes."